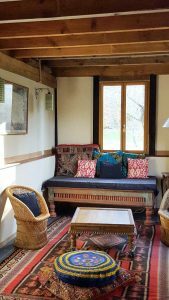 Les Petites Ecuries is a suite set in a outbuilding of the property. Very spacious (60 m²) and luminous, the room offers a nice salon, a kitchenett with micro-waves and mini-bar, a large bathroom with honeycomb towels and ayurvedic bath products, a nice room and a sit out facing the small lake of the property. The suite has maximum capacity of 3 persons. Les Petites Ecuries is available from mai until end of october.